SBIG ST-7 CFW-8; SBIG ST-237a for detailed spectrum at bottom. The top image is a single 4 second drifted (unguided) integration using the Rainbow Optics transmission grating combined with a wedge prism. This grism unit was then threaded into the CFW-8 filter wheel. A dark frame and flat field were used. MaxImDL was used to take the image and process the data. Calibration was done using VSpec software. Note the prominent Hydrogen absorption lines (the alpha, beta, gamma, delta, and epsilon lines are all visible here) starting at at 6562.852 Angstroms. 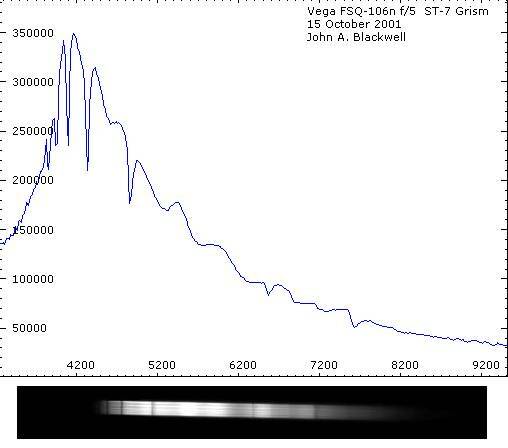 October 15, 2001.The second spectra was taken 14 November 2001 using the Takahashi FSQ-106n with a fiber fed spectrometer and an SBIG ST-237a. It is a one minute integration at -25C. The image was here was synthesized from the fiber image and graphed in VSpec software. The detail shows the Balmer Hydrogen lines Delta, Epsilon, Zeta, and Eta. 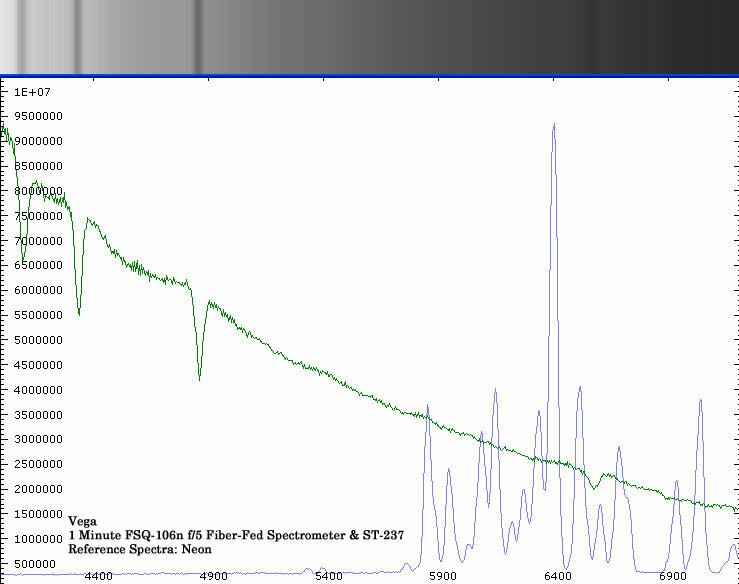 The third spectra was taken through a Takahashi FSQ-106n and a fiber-fed 300rules/mm grating spectrograph for one minute. A comparison spectra of neon is also on the graph for wavelength calibration. The spectrum was callibrated using VSpec software.